It's that time of the month again to share my playlist for the month with you! I started doing this in April I believe? And I still love doing it now! I've found I'm searching for new song releases and widening my horizon of music more! However, I do love going back to the oldies and listening to them on repeat too. Music has always been a big thing in my life ever since I was little. My mum was always a fan of music and even now we still have a large sound system with a record player on top. The traditional music system which ever one had back in the day! I also grew up with my sister who is 6 years older than me who is also a lover of music and she always had the best music too! I remember stealing her CD's and USB sticks to copy all of her music onto my computer. 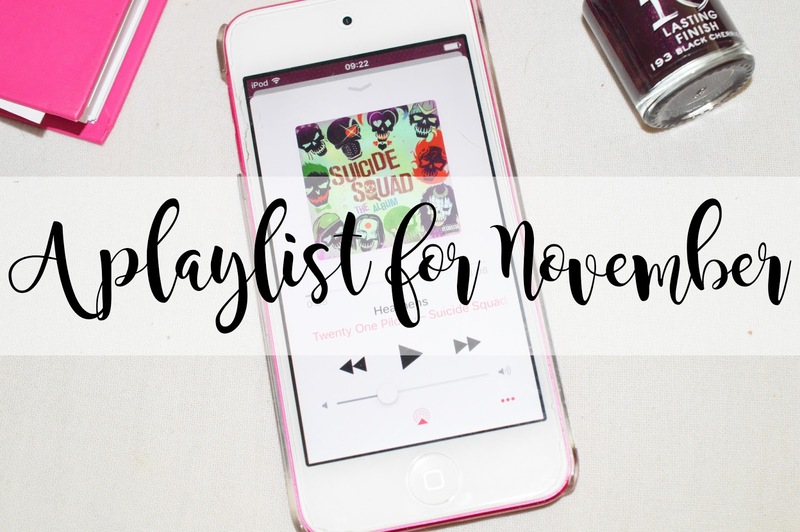 This month's playlist is featuring a few songs from last month's playlist as I still cannot get enough of them. Twenty One Pilots - Heathens is definitely my current favourite and was featured in my September favourites too! I hope you like this Playlist for November. If you have any song recommendations, leave them in the comments! I love this Playlist such a fab mix of songs. I'll have to go and check out the few I've never heard!